Please see https://releases.xamarin.com/beta-release-cycle-7-service-release-1-update-2/ for the details about this release. EDIT July 20: Update Release Blog links for newer Beta versions. EDIT July 21: Correct release name typo. EDIT July 27: Update Release Blog links for newer Beta versions. None of the release notes are up yet so we have no idea what's changed. iOS release notes are there, but Android ones seems to be missing. Visual Studio changes weren't up either. Shoot, yeah. Let me ask the teams about the missing notes. @BrendanZagaeski Also, the release notes state that 4.1.0.550 of Xamarin VS is the released version for this release. However, on the Xamarin VS changelog page, it says that 4.1.1 is part of Cycle 7 Service Release 0. 4.1.1 looks like a higher version than 4.1.0.550, so this looks very odd. @BrendanZagaeski any news on getting the release notes updated? @BrendanZagaeski Still no release notes? The release notes for "Cycle 7 – Service Release 1" should now finally be published for all products as of today's Beta channel refresh. I'm using the SignaturePad Nuget package. After installing the beta, I get the following errors attempting to pass an array of PointF into SignaturePadView.LoadPoints. @BrendanZagaeski Does this release allow us to debug again in VS2015? 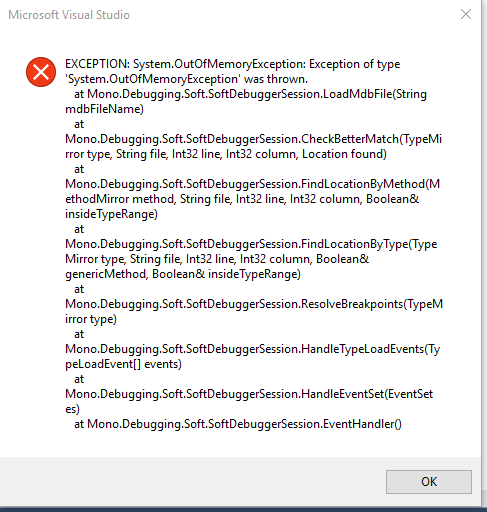 Or is there a workaround to the new Xamarin bug that if a breakpoint is set then VS2015 bombs out with an OutOfMemory exception? EDIT: BTW VS2015 last worked with 4.0.4 which is the version we have all reverted to. @BrendanZagaeski I just assumed that our team wasnt the only team using VS2015 and the latest version of xamarin. I guess I will have to track it down further. Interesting, yes please do file a bug report, ideally attaching a minimized zipped up test case that demonstrates the problem. Thanks! By chance I came across the CS0433 "exists in both" conflict for types in Mono.Android and System.Drawing myself while testing another issue. I am filing a bug report it now. I will post another update with the bug number in a moment. The conflicts between Mono.CSharp and mscorlib might have the same underlying cause, but if it's simple to minimize the test case that demonstrates that other conflict and attach it on a new (optionally private) bug report, that could be a could extra test case to have on file. Thanks! @BrendanZagaeski Workaround seems working. At least it compiles. The beta refresh from yesterday won't install as the Xam.Mac is failing to download. This currently makes it impossible for me to install some packages that target just 1.1, since I can't make a PCL that consumes 1.1. Anyone able to get the BETA refresh to install? Xamarin.Mac fails to download 2.8.2.22 so I can't get anything to install. I guess I could find the temp download folder and download all that has downloaded successfully come to think of it. It would be nice if the release notes linked to each download file so they could be installed manually if needed. As well as the Xam site dashboard have a channel picker with manual download links. The Xamarin.Mac package has now been re-published to fix the broken download URL. It should (hopefully) download correctly now. It would be nice if the release notes linked to each download file so they could be installed manually if needed. As well as the Xam site dashboard have a channel picker with manual download links. The approach to download links is under consideration to be revised. At this time I have no information on the possible timeline for when those changes might happen, but it is under consideration. First announcement was July 6. Its now Aug 1. Yet the page for the release still says "missing..."
Release notes are still not up to date. Supposedly this is stable channel. Can someone at Xamarin give us a status report? Is this a real update? What does it do/fix? Is it even safe to install given nothing else seems to say it even exists? ClintStLaurent, https://releases.xamarin.com/stable-release-cycle-7-service-release-1/ is visible to me at this moment. Note that the Release Blog and the forum threads are posted by hand at the moment, so there will sometimes be time offsets between the package availability in the updater, the Release Blog post, and the forum announcement. For example, I am working on updating the forum announcement now to account for the new "Stable" status. To which product's release notes are you referring? I quickly spot-checked the notes for Xamarin.Android and Xamarin.iOS, and they looked OK to me at a glance.